Hungry Howie’s is one of the largest pizza chains in the United States. To see what different career paths are available to you and to find out how to apply for Hungry Howie’s online, follow the link at the bottom of the page to get started on your Hungry Howie’s application today. The very first restaurant was opened in 1973 by James Hearn in Taylor, Michigan, and the original location is still in operation today. The corporate headquarters are now located in Madison Heights, Michigan. The company began franchising in 1982 and there are now over 575 different locations across the country. Their menu unsurprisingly contains a variety of different pizzas. There are classic flavors such as Philly Cheese Steak and BBQ Chicken and some new creations including Bacon Cheddar Cheeseburger. In addition to that you can also find a range of calzones, salads, rolls, wings and also Howie bread that comes in sweet and savory flavors. But what the restaurants are most well known for are their flavored crusts. The eight different flavors that you can choose from are butter, asiago cheese, cajun, butter cheese, sesame, garlic cheese, ranch and onion. There is also a gluten free option. The flavors are available on any of their pizzas and can mixed and matched. There are always many job opportunities with Hungry Howie’s careers if you are looking to get started in the food service industry. The most common position is Insider, an entry-level position for which you won’t require much experience. There are also jobs for Delivery Drivers and managerial roles which will require previous employment experience. 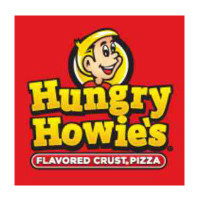 From time to time there will also be Hungry Howie’s jobs available in their corporate offices or in franchise support. You will have to make a direct application for these roles. The types of departments you can send in applications to include Administration, Accounting and Finance, Human Resources and Information Technology amongst others. How old do you have to be to work at Hungry Howie’s? You must be at least 16 years old or over to apply for jobs at Hungry Howie’s. As the locations are franchised the exact benefits that you receive in Hungry Howie’s jobs will vary depending on your location and job description. For entry-level employees the benefits will generally be the opportunity to collect tips while working and being able to take advantage of a flexible working schedule. For other employees there may be health insurance options and retirement plans. The restaurants are open from 11am daily and then they close at 10pm Sunday to Thursday and on 11pm on Fridays and Saturdays. Delivery Driver – The primary requirement for this job will be to have a valid and clean driving license. The responsibilities of Delivery Drivers are to take the orders out to the customers and to collect their payments. The best applicants will be ones who have a good knowledge of the local area. The typical pay for this role starts at $7-8/hour. Insider – Insiders are the team members of the restaurants. The general daily duties include taking customer orders and serving them, processing payments and answering any general enquiries. There will be other tasks as assigned by the managers. You will also be expected to help prepare food. The pay is usually between $6-8/hour. Assistant Manager – Assistant Managers have a number of duties above and beyond that of the Insiders. You will help with supervising the staff and ensuring that they deliver customer service to the highest standards. Assistant Managers will also help with opening and closing procedures. The salary is generally paid hourly at a rate of $10. General Manager – General Managers have responsibility for the entire restaurant. General Managers are responsible for the hiring, training and ongoing management of staff. There will also be administrative duties including scheduling and payroll. The salary for this role is also paid hourly and is usually at a rate of $11-12 an hour. After you have sent in your Hungry Howie’s application you should try to practice some common interview questions to help you prepare. Why do you want to work here? Always do some research on any company that you apply for before you get to the interview because this is likely to be the first question asked. Try to be enthusiastic about the company. What is your favorite kind of pizza? You’re going to need to be passionate about pizza if you want to work at this kind of establishment. Pick your favorite topping, but make sure it’s off their own menu. How would you handle a customer complaint? Working in this type of role you are likely to need to diffuse tense situations occasionally. If you have worked in this type of industry before then give a similar example. What are your greatest strengths? You should always make sure when you answer this question that you keep your answer relevant to the specifications that are required for the role that you are specifically applying for. What is your availability? Always make sure you have your schedule worked out before you go. There will be different shifts available and they may have specific ones to fill and so it will help if you can be flexible. If you’re looking for jobs based in the restaurants then the hiring practices will be different depending on the location. For some restaurants you may be able to apply online but for others you can’t. You can request a free application form from your local restaurant itself or else you can download a printable application for Hungry Howie’s. You can submit a Hungry Howie’s job application online for careers in their headquarters. By searching Hungry Howie’s jobs online you can find their open positions through recruiters or by contacting them directly. Via recruiters you can fill in the online application and upload your resume to express your interest in working for the company. For restaurant-based positions you may be asked to come for an interview not long after you apply, maybe on the same day. Therefore you should make sure you are prepared for an interview in case this happens. Make sure you are well presented when you turn up to meet the manager for the first time. Remember that in any job involving customer service it is very important to be friendly and positive as well as professional. Always remember to smile and maintain eye contact with your interviewer. It might sometimes be necessary to follow up after your interview by phone or email to check on the status of your application. BJ’s Restaurant & Brewhouse: For career opportunities, fill out the BJ’s Restaurant & Brewhouse online application. The Yard House: For employment at The Yard House visit the application page. T.G.I. Friday’s: Visit the T.G.I. Friday’s application. Papa John’s: Papa John’s offers opportunities for both, beginners and experienced roles. Houlihan’s: Visit the Houlihan’s application.